“El Tapeo” is the national sport in all cities from Spain. That is why many travelers come to Barcelona, one of the first things they want to do is try nice tapas. The tapas in Barcelona go from “patatas bravas”, “pinchos morunos”, ham croquettes or the famous “Fried Fish”, the typical fishes used to fry are the sardines or squid. Barcelona, as you can imagine, has a large tourist hotels and catering offer, so there are many options to go and have tapas. There is no neighborhood in this great city in which you can’t find a “Tapas Restaurant”. 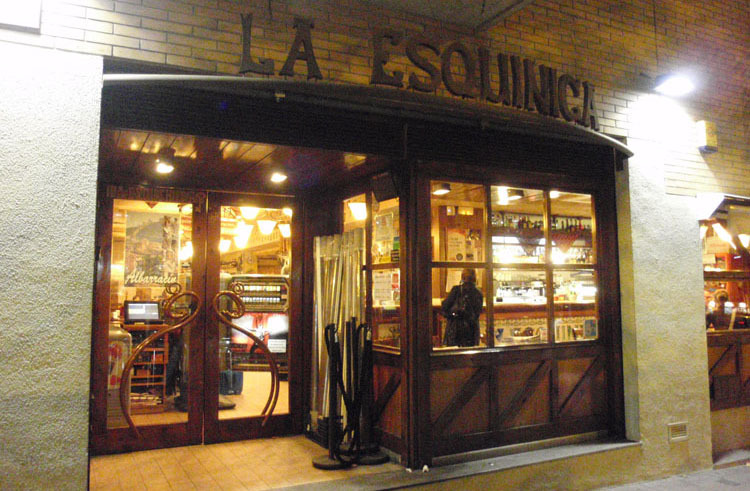 La Esquinica is par excellence the restaurant where you have to go for tapas in Barcelona. With Aragonese roots, this restaurant is located in the Guinardó district, close to the metro line 5 stop Viceroy Amat. Since it is one of the most famous restaurant for Tapas in Barcelona during the weekend is full of people. The restaurant does not take reservations, so you have to wait to be assigned an entry number. La Esquinica is one of the best tapas restaurants in the city. In addition, the value is optimal. 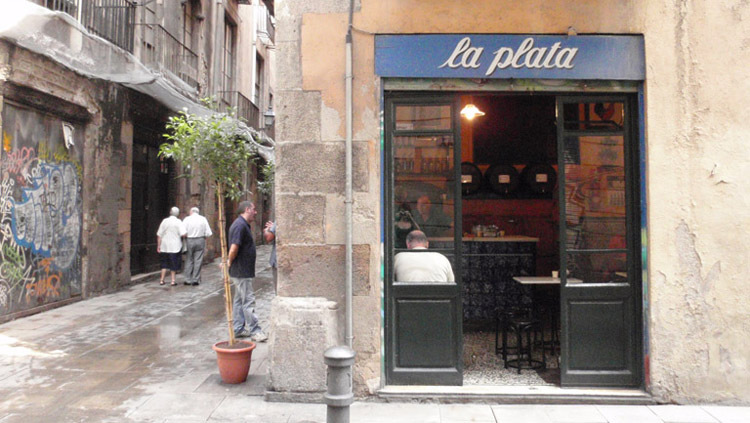 Bar La Plata is a small restaurant located in the Gothic Quarter of Barcelona. With a charming environment, it has tapas and premium products. Not only for its décor, which is inspired by Andalusian style, also the tapas salad of tomatoes, sardines or sausage, will make you want to visit this fantastic restaurant. 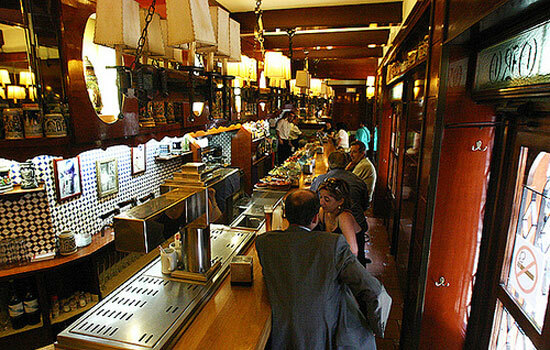 The Xampanyet is one of the most famous tapas bars in the neighborhood of Borne in Barcelona. This restaurant has a family environment, and also has a nice and informal atmosphere. The restaurant is one of the most famous for tapas in Barcelona. In addition, it is specializes in cured meats, cheeses and a wide range of “Pinchos”. It also takes its name from the special white wine they serve. El Vaso de Oro is located in the heart of Barceloneta, this Quarter is one of the top destinations for all travelers because its lively beach with great atmosphere. In the “Vaso de Oro” You can taste different types of beers. As the name indicates this bar, is specialized in beers and also offers local tapas to go along with your beers. El National is located in the heart of Barcelona, to be more specific is located in “Paseo de Gracia”, close to the Gran Via de les Corts Catalanes. Considered the largest restaurant in Spain, it has several areas divided by type of food among which you can choose. You cannot miss this place on your tour of tapas in Barcelona! The peculiarity of this restaurant comes from the fact that the waiters pass with trays full of tapas shouting the dish that they are about to serve. If attendees want to eat one of those dishes, you just have to stop the waiter and ask for the Tapa. Do you fancy coming to Barcelona and visit at least one of these “Tapas Restaurant”? Do you know more “Tapas Restaurant”? Give us your feedback! El Xampanyet y la Esquinica son dos de mis favoritos en BCN. ¿A nuestra vuelta lo celebramos en uno de ellos? Un abrazo muy fuerte y gracias por transportarme por un rato a “mi querida ciudad”.